I have written this blog back in summer 2011, well before the IEEE802 presentation on 12th January 2012 which was used as a pretext for the creation of PAR for 802.1Qbv or time-aware shaping, as a core new initial amendment of TSN standard. Around the time this blog was written TTTech has worked on all preparations and briefing of Cisco teams and their opinion makers in the second half of 2011. Initial briefings of key networking players began in mid-2010. At that time noone understood really what is TTTech talking about, except few Cisco guys involved in the industrial switch business. They could see some relevance, but they had a mantra of low-latency communication, and could not really get forward in convincing ther camerades that there is the world beyond asynchronous best effort communication with minimized network engineering. First in the meeting with the head of advanced architecture and research at Cisco, things started moving at faster pace. This guy recognized what we have based on this one slide, and figured out what could be the potential impact on Ethernet and new applications. It seems this was the best placed single slide I ever made. Soon after that there much more intense interchange started. By Q4/2011 there was the conclusion to approach IEEE and present the case to see how the IEEE802.1 community in Munich interim meeting will react. The feedback was positive and Cisco created a 802.1Qbv PAR which referenced SAE AS6802 - the standard SAE created between 2009 and 2011, mostly focusing on aerosace, space, defense and other industial applications for critical integrated systems. By August 2012, the group figured out that IEEE AVB2 with Time-Aware Shaping has a much broader meaning for multiple high-volume industries, and rebranded the effort to IEEE TSN. From this point we could say, that Ethernet will be and is a strictly determnistic networking technology, which can support both asynchronous and synchronous communication. With automotive applications and IoT with billions of ports projected for 2025, it will become a baseline for integrated hard RT applications and controls. With addituional services introduced in 2014-2016 there are no doubts, that it will become the driver of IoT and IIoT world. IEEE TSN effort spun off additional ideas in Real-Time Internet and DetNet. The use of Ethernet in long-term programs helps to minimize risks of technology and component obsolescence. There are no other system integration technologies on the market with such continuing industry momentum and guaranteed growth. 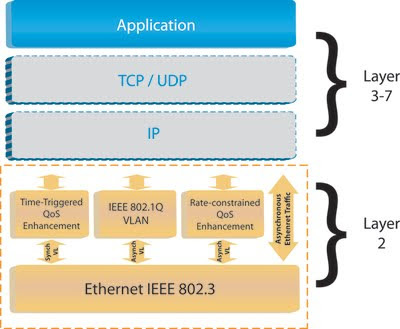 Ethernet enjoys tremendous support in different commercial and industry applications, however, a limitation to its use in critical embedded systems is its capability for deterministic communication with mixed time-criticality, and continuous synchronization tolerant to different fault scenarios. Finally, Ethernet has not been designed for TDMA networking, but for packet-switched communication in non-critical networks. Ideally, deterministic Ethernet would allow synchronous (circuit-switching) and asynchronous (packet-switching) communication for any type of standard, mission-critical and real-time applications. It is possible to integrate different types of traffic in one network, by simply adding Layer 2 QoS enhancements. In this case, standard LAN, low-jitter and low-latency applications can use shared communication resource (see image below). In the real-world, the term determinism can be selectively used in one or more dimensions, e.g. we talk about very deterministic (defined max. latency)! or more deteministic (minimized latency, in most cases) communication. and related to synchronous TDMA communication, and not considered a standard Ethernet capability. Fortunately, Ethernet is not a monolithic standard – it is a family of frame-based networking LAN/MAN technologies and can be extended by additional Layer 2 Quality-of-Service (QoS) enhancements to satisfy different industry- and application-specific requirements. By using those otherwise transparent network services, distributed applications can advance their real-time capability and deterministic operation. 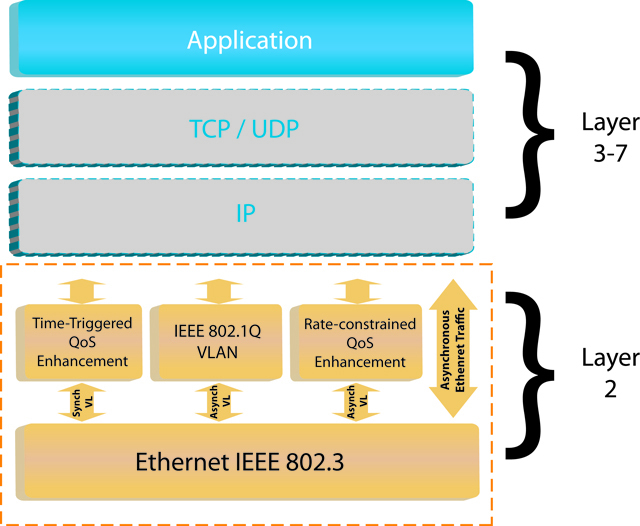 As an example, VLAN and IEEE802.1Q are typical widely used QoS enhancements for priority-based traffic which, in conjunction with limited bandwidth use (i.e., <10% of available bandwidth), support more predictable network operation, but still without any absolute guarantees for temporal performance and determinism. This is called “more deterministic” communication, and does not represent a real advantage for time-critical embedded systems, which require predictable or lossless communication in all system operation scenarios (including faults). QoS Layer 2 Services such as SAE AS6802 allow strict determinism with full control of jitter and fixed latency (synchronous TDM-type communication), while fully supporting asynchronous Ethernet traffic in parallel. This type of capability enables unified networking and emulation of circuit-switching over packet-switched networks, and full isolation of synchronous and asynchronous traffic. The system synchronization service is one part of SAE AS6802 standard (compare IEEE1588 to SAE AS6802 synchronization). Together with other Layer 2 rate-constrained/time-sensitive (e.g. IEEE DCB, ARINC664/AFDX or IEEE AVB), or priority-based VLAN services it is possible to design Ethernet networks for lossless, low-jitter, low-latency and standard LAN applications. By doing so, Ethernet covers all types of determinism and represents a unified networking technology. - Deterministic Unified Ethernet.